Berths: one fixed double and six single, or two double and four single, in four cabins. 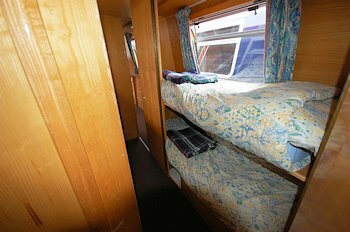 For 8 people, two top bunks can be fitted in the middle cabins. The back end is cruiser style with a handrail. The front cockpit has seats either side. An inverter provides 240v AC, to power any of your own normal mains appliances up to 1000 watts. There is mains hair dryer (more powerful than on other boats). The engine is an Isuzu 4-cylinder water-cooled diesel. The saloon at the front has an L-shaped settee with a table which can be hidden away when not required. The settee converts either to a double bed or to two singles. There are large drawers under the settee. Radio CD player with 4 speakers, and TV/DVD player. The forward toilet has a washbasin and shelf. The galley has a fitted cooker (with 4 burners, grill and oven), fridge, microwave and? lots of storage. The middle bedroom is in two compartments with a dividing door. 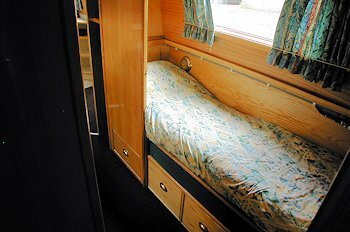 Each has a fixed single bed, over which an optional top bunk can be fitted. The mattresses are foam covered with cloth. There are drawers and storage under the beds, with shelves and a hanging space. The bathroom has a shower bath, toilet, basin with shelves, and radiator. There are dividing doors in the corridor. The master bedroom has a fixed double bed (our special one-poster design) with sprung mattress, drawers under, a wardrobe, wet locker and airing cupboard.